All time favourite snack for everyone is Urad dal vadai (Medhu Vadai/Ulundu vadai), you can serve hot with coconut chutney and hot idlis or you can make sambar vadai or curd vadai with this vadai batter. Urad dal is very good source of protien and fiber. 1) Wash and soak Urad dal/Ulundu for 1 hour. Drain water and grind it with Salt. 2) Add Asafoetida, Curry leaves, Coriander leaves, Cumin seeds, Grated coconut, Onion and Green Chillies. 3) Heat oil in a pan. 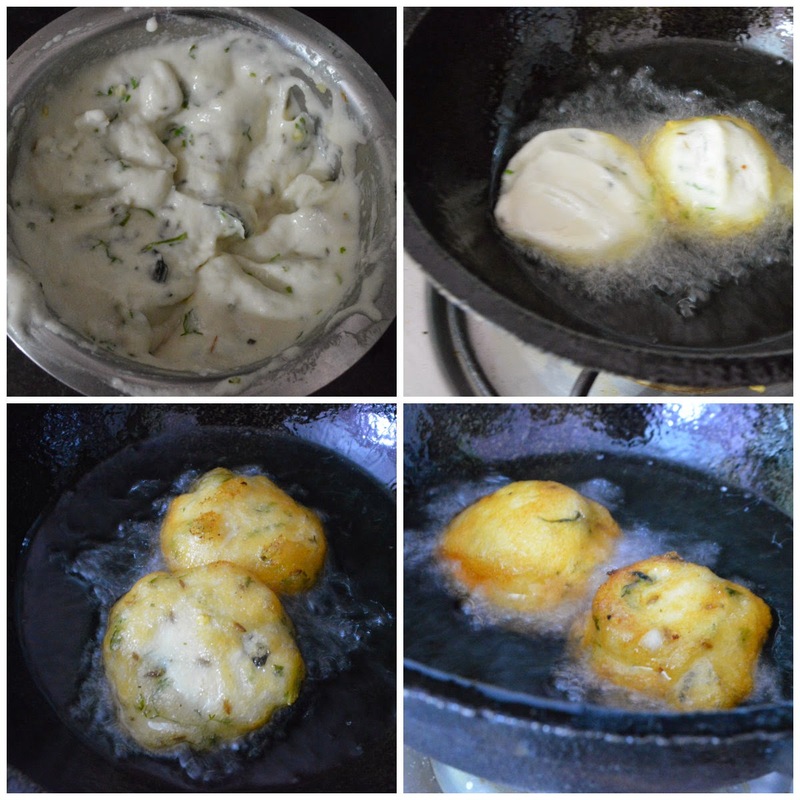 4) Make round shaped vadai from batter and drop it in oil. 5) After one side of the Vadai is cooked, flip it round. 6) After both sides are done, take the Vadai and put it on paper napkins to drain the extra oil. Crispy Vadai is ready to be served. 1) Apply a drop of oil on banana leaf or plastic sheet. 2) Wet your hands to take a ball of batter, and to avoid sticking to your hands. 3) Keep it on banana leaf or plastic sheet and pat it gently in the middle to make a round shape. 4) Make a hole in middle of batter. 5) Slide it to oil. 6) If you have good practice, after taking batter in hand (with out leaf or plastic sheet) you can make vadais by gently patting it and making a hole with thumb. 7) If you don't want the hole in vadai, you can skip it as I did. Please see the video on how to make vadai with hole. 1) When you grind soaked Urad dal, don't add water as you do for idli batter. You need to sprinkle now and then when it grinds. Less water will make thick batter and gives nice crispy Vadai. Also it will absorb less oil. 2) If you like Black Pepper, you can add 1/2 tsp to batter. 3) If you don't want the chopped Green Chillies to come in your mouth while eating, you can grind it along with soaked Urad dal. 4) Before frying the Vadai, keep the oil to heat in medium flame. Once the oil is hot, add the balls of Vadai batter. And after you put the Vadai, maintain the same temperature. If you keep the flame to high, Vadai will get cooked only outside but the inner part will not be cooked properly. 5) I always prefer Cast Iron Kadai for frying Vadais as it gives nice crispy ones. 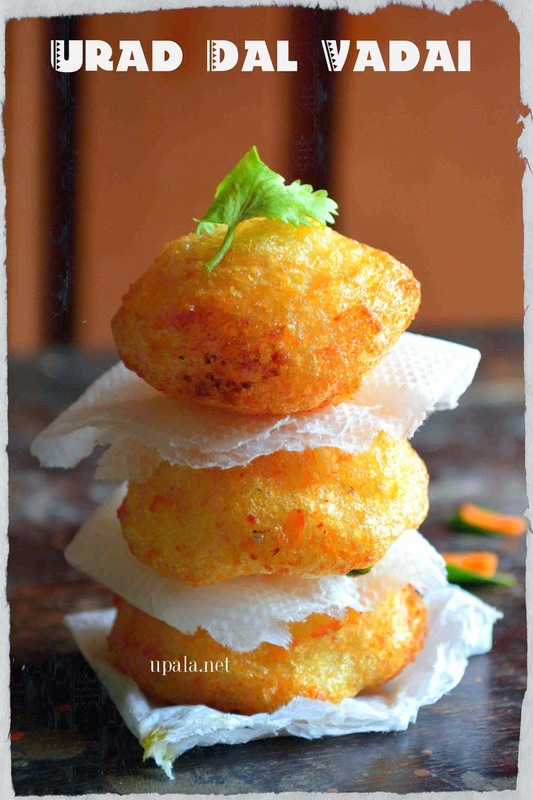 6) Adding Grated Coconut enhances the taste of Vadai. Instead of grating, you can slice the coconut to thin pieces and add. 7) Grinding the soaked Urad dal in grinder will give soft Vadai than grinding in mixer jar. 8) If you want to use Bar Asafoetida instead of powder, you can soak it (half a size of green peas) for half an hour in a tsp of water and add while grinding Urad dal. 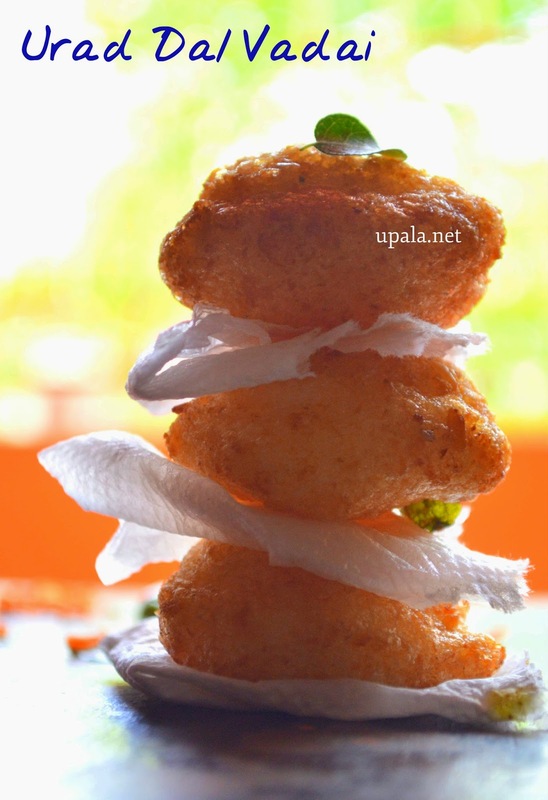 9) This vadai tastes yummy with out Onion too.